Review: Sleepwalkers, giant trees, and a hidden country called Dormia. The second book of Dormia,: World's End by Jake Halpern and Peter Kujawinski introduces Alfonso Perplexon, now fifteen; involuntarily leading himself on an all new adventure. The second installment of the Dormia series doesn't disappoint. While just trying to lead a normal life, Alfonso Perplexon starts doing some pretty odd things in his sleep, like being led to a hexagonal hole underneath Paris and stealing doctors' needles. But that's not all. He soon finds himself in Alexandria on a quest to save his thought-to-be-dead father, master hyponogia, and save the long-lost city of Jasber. With a rosewood box teaching him the secrets of hyponogia, a stage between waking and sleeping, he may just save the world. World's End is full of non-stop action, and never ending suspense. For example, "Moments later, the rope fell into the water and the freighter pulled out of Marseilles' old harbor into the open seas of the Mediterranean." The characters in this book are very well developed. I rate it a 9 out of 10. It is amazingly interesting, and impossibly exciting. I could not put it down! The beginning is a great explanation leading up to the start of the action. I love how well the author describes every little detail. We would like to thank Houghton Mifflin Harcourt for providing a copy of World's End for this review. 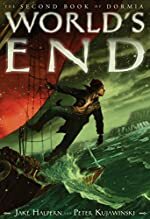 Have you read World's End? How would you rate it?